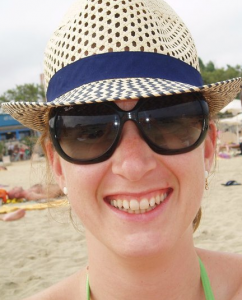 Today’s spotlight is on Zsoka Marko, another talented scrapbooker I’ve had the pleasure to meet whose work inspires me! Tell us a little bit about yourself and how you got started crafting: I’m Hungarian but I’ve been living in Germany for over 11 years. 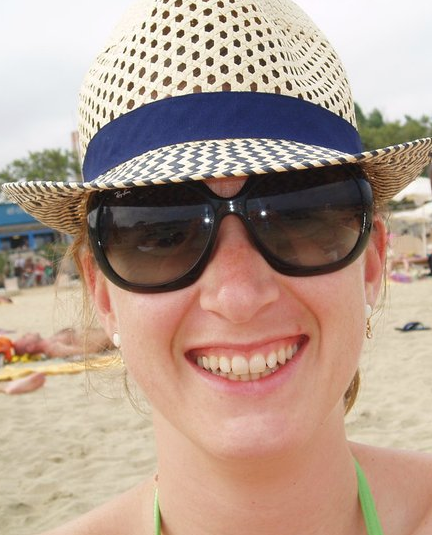 I live with my Dutch boyfriend and our 7-year-old son in the old center of Neu-Isenburg, a small town next to Frankfurt. I’ve been crafting all my life! As a kindergarten kid I was very good at drawing so I did all sorts of competitions. As I got older I lost interest in it… I wanted to study arts but my parents said one could not make a living with it and that art was just a hobby, so I focused on languages instead. Crafting really came back after I finished my first degree and started working. I did everything from silk/glass/porcelain painting to mosaics and anything in between. I quit mosaics when my son was born because I was not able to cut glass safely in our small place without worrying that he would crawl into glass splinters. ( I still want to get back to this but I need a craft room first!) Then came cookie and cake decorating… I loved it so much! But then I faced health issues and lost my mojo. After my surgery in early 2015 I needed something to keep my mind off of the constant pain. I always wanted to try scrapbooking so it felt like the right time to start! I was at home for a long time so I had all the time in the world! As opposed to baking, I could do just half an hour and if I had no strength for more, I could stop then and continue a day or a week later if need be! I very quickly got addicted and I do hope this craft will stay with me for good! I am honored to be a DT member at Scrapbook Werkstatt, The Cut Shoppe, and Scrap Our Stash. I was also lucky enough to guest design for Pink Paislee and Shimelle; the proudest moments of my life, I think! Favorite thing to create: I mostly create 12 x 12″ layouts and the occasional mini album. Lately I also started making cards when I want a bit of change. What do you love about this hobby? Hard to tell! The art, the beautiful designs… and of course the main reason I started was to document my son’s life. I don’t have many photos from my childhood and I really wish I did. 1. I am a series junkie. There. I said it. I always have a tab open on my desk while scrapping! 2. Since I started scrapbooking I can count on one hand how many pairs of shoes I bought (or clothes for that matter). And I used to be known to wear different shoes every day! 3. I’m addicted to sweets, especially Ben & Jerry’s Half Baked ice cream. Unfortunately you can tell. 4. I never use make-up, only mascara. I don’t even know how to apply it! 5. I passionately hate cooking. I have no idea where this came from because I used to like it and also in my family every body cooks well. Thank God my boyfriend loves to cook! When he is away for work, though, we live on toast. Bad mom! I decided to make a mini album because I just received a lot of the Pink Paislee Fancy Free collection and I wanted to use everything right away! I am very bad at making decisions, so selecting only a few items for one layout?! Just no. 🙂 We had recently gone for a day trip and I thought this would be a nice way to document it. This is actually the first mini album I made for us, so far I have only made them for family and friends. Last year I watched Ashley Horton’s class “Mini Made Easy” at Big Picture Classes and I found it so inspiring I made my first mini. Ever since I use the same technique: extra cardstock between the two layers of patterned papers and stitched all around – because I want my albums to stand the test of time. Don’t get me wrong, I like the look of those messy tag minis, but I feel these are more sturdy, especially when little fingers flip through them a lot! I also incorporated a lot of cut files from various shops, The Cut Shoppe, Just Nick, some freebies from Nicole Nowosad for Scrapbook and Cards, and also from the Silhouette store. Then I added a whole lot of embellishments, ephemera, buttons, tags, wood veneer, puffy stickers, and chipboards, mainly from the Fancy Free line and the odd stuff from my stash. I also hand stitched one page because lately I do that a lot again. I had a phase last year where I did a lot of hand stitching. I really enjoy working on minis; this was definitely not my last! This is one of my most fave layouts ever. You know when you don’t actually plan something, it just happens? This was that case. I was playing with my new stamps, white embossing powder, and watercolor, and once I fussy cut the leaves I just put them down in a circular shape. I loved them and I thought they would look neat on a layout! I love, love, love the colors in this. This was a recent DT layout for my chipboard team, I Kropka. I really love their products! While I do a lot of different style pages, this is one that I do most, cut files, circles, and patterned paper! And blue. I learned to like boyish colors because there’s man power at home and we need to compromise. I do sneak pink in, too, now, as long as my son is not a teenager I guess I’m allowed to, lol! 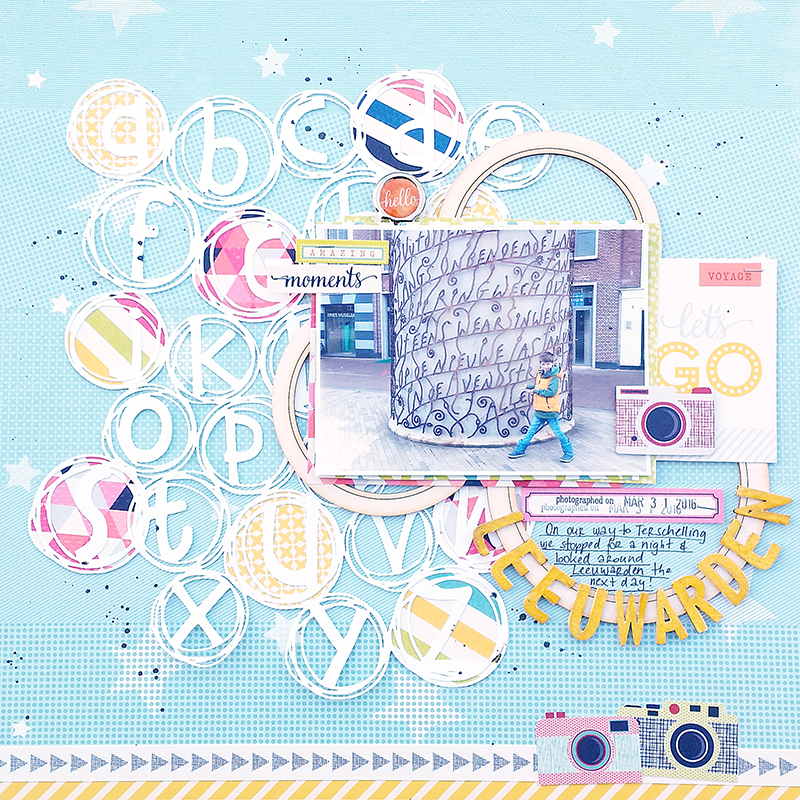 This was also a recent DT layout, with the June kit at Scrapbook Werkstatt. Again, it shows my love of circles, patterned paper, and cut files. This kit was very fresh and summery so all my layouts turned out to be very white! I generally go for patterned papers for backgrounds so it was a bit unusual to use so much white. Out of the six layouts I made with this kit, this has the most color in the background. Thank you so much for stopping by today! Be sure to visit Zsoka’s fantastic sites to see more of her incredible and colorful work! 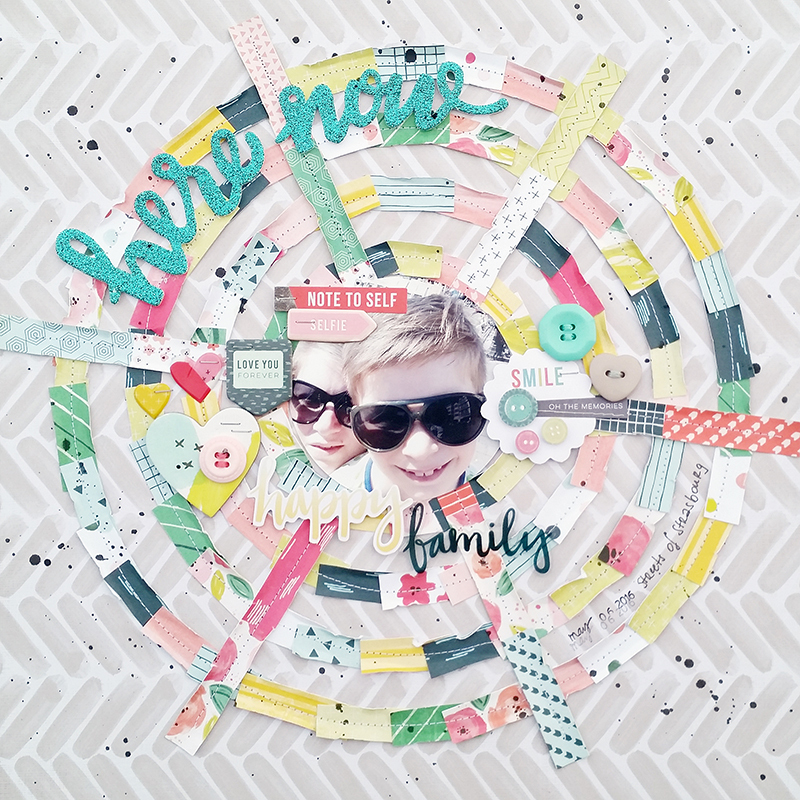 This entry was posted in Blog, Designer Spotlight, Scrapbooking, Spotlight and tagged 12x12 layouts, Big Picture Classes, fancy free, Mini album, Pink Paislee, Scrapbook Werkstatt, Scrapbooking, spotlight, zsoka marko. Zsoka, your page layout are so fresh and original. For a scrapper getting back in to it I know this would inspire me. I can see how I can use the little bits and create something beautiful. Such fresh ideas? I do love your love layout and how you used the leaf stamp to create the background for the letters: L-O-V-E.